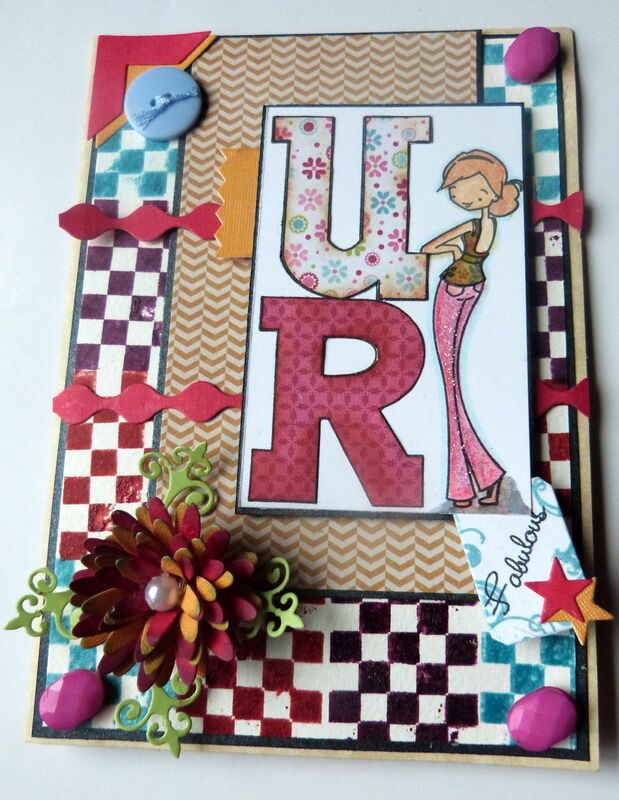 I made this card using the sketch for the June contest in MFT stamps. I knew I wanted to use the ALM- I’ve Got your back, love it, it is sweet. the long panel fit right into it. I started with creating the background. I used MFT Bon Appetit. the checkered background was perfect for this. I stamped it in Broken China, Seedless Preserves and Fired Brick distress inks. I clear embossed the entire background once it was stamped. I did it on Watercolor Paper. I had done it with lighter color and spritz with water and did not like the look of everything mingled in. This is more a crisper look and went well with the image. The long panel with the chevron stripes is form Miss Carolina. All layers have a black background, i like how that gives a cleaner look. The ALM I’ve got Your back has this gorgeous big letters, the entire image was stamped and clear embossed and then paper pieced with We R memory-lovestruck, Happily Lost from Lily Bee Design. they were all brushed with Tea Dye Distress ink. She was colored with Prisma Color Pencils, I added some stickles to her pant and used B00 for her background and N3 and 5 for her to stand on. I stamped Fabulous on the Notched tag with Finishing Flourishes around it.I added a couple of stars from the Notched Tag. I then added lots of tiny elements to bring the card to life. I added the Mix and Match Banner for the side tab. I added Squiggle Dienamics for the two long panels. There are photo corners with a Laura Ashley button. I added the Rolled daisy in two colors and brushed with broken china distress ink, there is a pearl tucked in between and layered on two Vintage flourishes. I then added some pearls from my stash. Here is the inside. 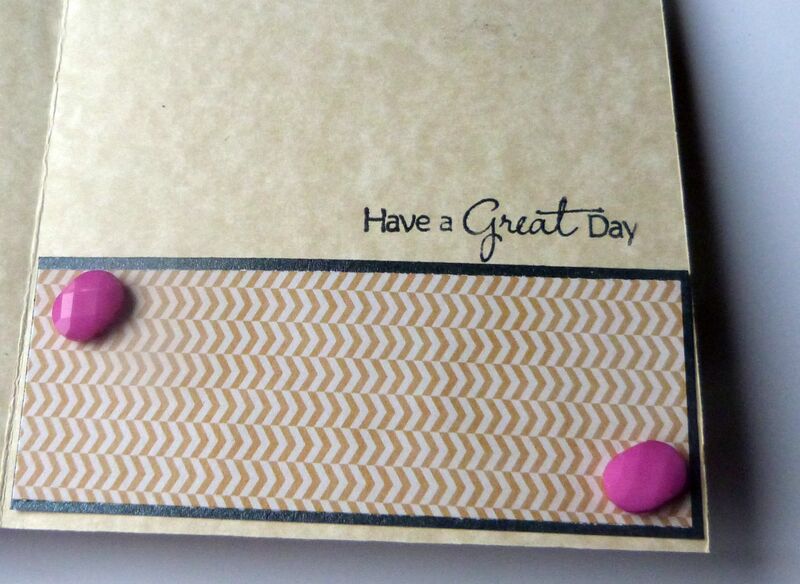 I stamped a sentiment from All Smiles with the chevron stripes paper and two beads. What a fun card! Love the image..Great paper piecing and love that you decorated the inside too!